Paul O. Zelinsky (born 1953) is an American illustrator and writer best known for illustrating children's picture books. 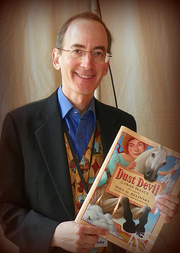 He won the 1998 Caldecott Medal for U.S. picture book illustration, recognizing Rapunzel. His most popular work is The Wheels on the Bus, a best-selling movable book. Paul O. Zelinsky is currently considered a "single author." If one or more works are by a distinct, homonymous authors, go ahead and split the author. Paul O. Zelinsky is composed of 6 names. You can examine and separate out names.